The versatility of elegant men’s linen shirts makes them a worthy addition to any man’s collection. You can count on these shirts whether the occasion is formal or casual. The trend seems to be picking up more rapidly for beach weddings where men: guests, groomsmen and the groom are looking no further for the perfect outfit. What makes linen shirts for men the first choice for many? There definitely should be a reason behind the increased purchase of linen shirts. The first thing about linen is that you can count on it to be in shape for a long time because the fabric is durable. You will only have to make sure that you get the right quality. The other thing, which is why it is used for beach events like beach weddings is that it is breathable and comfortable to have on especially when the weather is hot. There is no doubt that with the increase of vendors online you are likely to fall prey to imposters offering low quality masquerading as top quality. That is why you need to have considerations when making your purchase, but if it something that you haven’t thought of before, then it is a good thing that you are here. For any piece of clothing to look good on you, it is vital that you get not only the size but also the fit right. This has more to do with confidence than just comfort. A well-fitting linen shirt will make you presentable and comfortable to be among other people. Many online vendors will always allow you to choose the fit and the size that you want, but if the options are limited, move to the next. 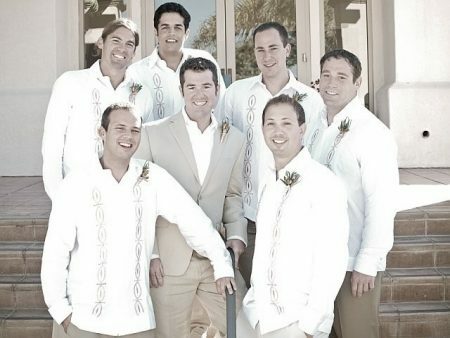 When choosing men’s linen shirts for a beach wedding or any other similar occasion, the color becomes relevant. Many people like to choose the theme color for the wedding or event. For men, dull colors are advisable because of their versatility. Design, when purchasing men’s linen shirts becomes worth considering when you plan to use for a particular occasion. 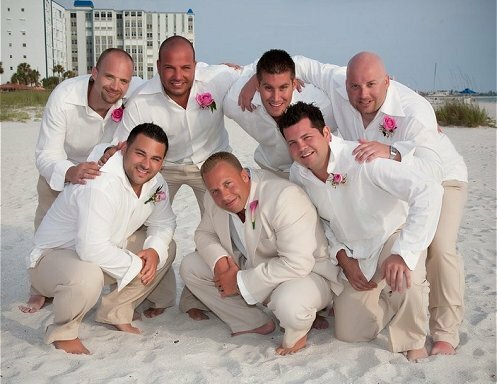 For instance, beach weddings have all kinds of themes, and if you choose to go Caribbean, then you should make sure that the linen shirts of the groomsmen don’t say otherwise. 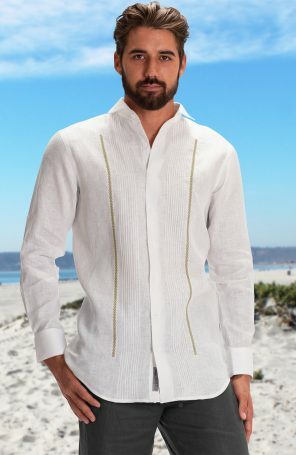 Another design that goes well with linen shirts for men is guayabera. The rows of patterns on each side of the shirt can complete an elegant yet classy look that you need for that day. Many a time people want to place orders with specifications, especially when they need more than one linen shirt for men. The best thing to do in such an instance is to use a vendor that allows for customization of orders. It is worth noting that if you plan to customize your order for an event like a beach wedding, then timing is everything. At Wedding Tropics, we allow for efficient order customization after which it takes about 4-6 weeks for your order to be ready for delivery. 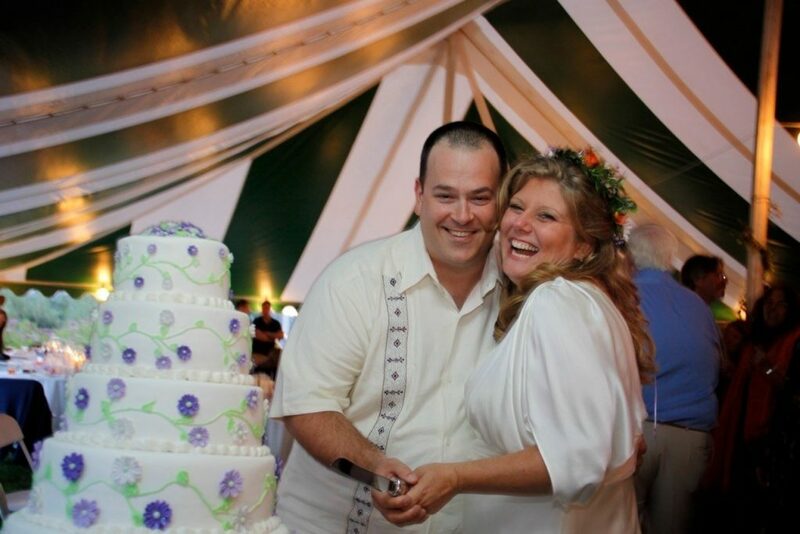 “Thank you so much for the wonderul wedding shirt we received! Everyone commented on how handsome my husband looked in it. It was perfect for our beach wedding on Kauai.